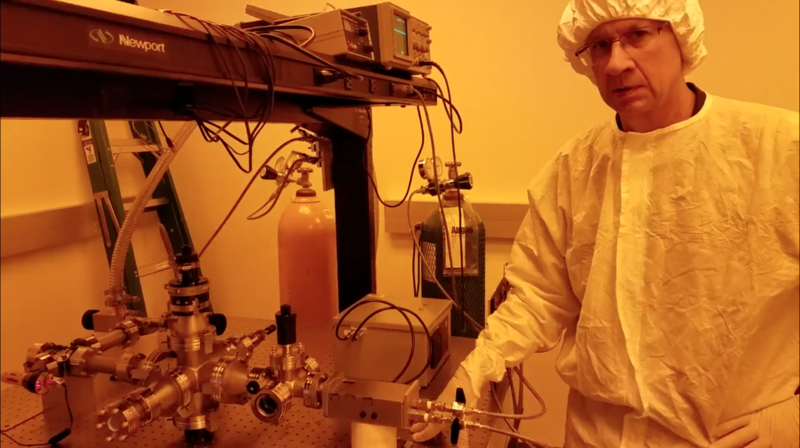 Tucson, Ariz. – A team of researchers at the University of Arizona’s top-ranked College of Optical Sciences have invented a new breed of Raman vacuum ultraviolet spectrometer capable of rapidly analyzing the chemical makeup of materials. A creative and experienced team of entrepreneurs worked with Tech Launch Arizona, the office of the UA that commercializes inventions stemming from research, to license the technology into their startup, Botanisol Analytics. The company, an affiliate of Botanisol Holdings, is targeting the expanding markets for natural products, pharmaceuticals, and molecular compounds in general, although the spectrometer could find use in many applications. UA Professor Tom Milster with the bench-top version of the Raman vacuum ultraviolet spectrometer. Photo credit: Tom Milster. Through his research at the college, professor Tom Milster and co-inventors Pramod Khulbe, PhD, and Barry Gelernt, PhD, invented a new spectrometer that operates in the vacuum ultraviolet portion of the electromagnetic spectrum. An instrument based on the invention is currently under development. The device will deliver product information allowing consumers and regulators to know with certainty exactly what is in a product and make decisions based on an accurate analysis of a sample’s content, from contaminants to levels of the active ingredients. “We initially thought that the primary use for this spectrometer would be inspection of semiconductor wafers, but we realized that it has great value in analyzing the molecular makeup of natural products for safety and quality control,” reflects Tech Launch Arizona Licensing Manager Amy Phillips noting that the device can be used to certify, for example, that hemp-based products contain a less than 0.3 percent concentration of tetrahydrocannabinol or THC, the psychoactive component of cannabis. As more states legalize marijuana for medical and recreational use, the need to offer appropriate controls to protect user safety is rapidly increasing. When it comes to understanding the quality, potency and potential contaminants of the product, consumers have little to no way of knowing exactly what they’re getting. Many patients wish to receive the medicinal effectiveness of marijuana while avoiding the psychotropic effects. Also, the invention’s ability to identify the presence and abundance of specific molecules will allow researchers to zero in on the molecules responsible for intended affects, as well as the molecules that create unwanted side effects in all types of medicinal products. According to experts, one example of contamination in marijuana is the popular fungicide myclobutanil, which, when heated, converts into cyanide and other toxic byproducts. In California, an estimated 70 percent of the cannabis harvest is contaminated with such compounds, which can be concentrated multiple times during processing. While the industrial hemp and medical marijuana markets are the initial targets, Botanisol Analytics plans to move into multiple industries where chemical detection and analysis is a needed function. The UA invention also determines the abundances of the chemicals that are detected. Medical advisor to the company, Farhan Taghizadeh, MD, is particularly excited about future clinical applications. "Our spectrometer is a unique tool that has broad implications for both cancer drug research and clinical diagnostics,” he says. “From analyzing molecular compounds to picking up serum markers, our point of care technology will provide detailed analysis in a matter of seconds. We are excited to collaborate with key industry leaders to advance this revolutionary technology." The company is producing a limited number of commercial alpha units which it plans to put in the hands of select strategic partners in 2018. The Botanisol Analytics team participated in the NSF I-Corps program at Tech Launch Arizona, which prepares scientists and engineers to expand their focus beyond the laboratory and increase the impact of basic research. As of the writing of this article, 30 states and the District of Columbia have laws legalizing marijuana for medicinal and/or recreational use.